10W Faster Wireless Car Charger-Higher charging efficiency with the third generation independent coil, faster charging your phone than old wireless chargers.If you use the QC 3.0 charger adapter, our wireless car charger will fully charge your mobile phone within 2.5 hours. This Car Wireless Charger is Adjustable Holder Length-You could adjust the length of the holder to fit your phone to the best charge position. 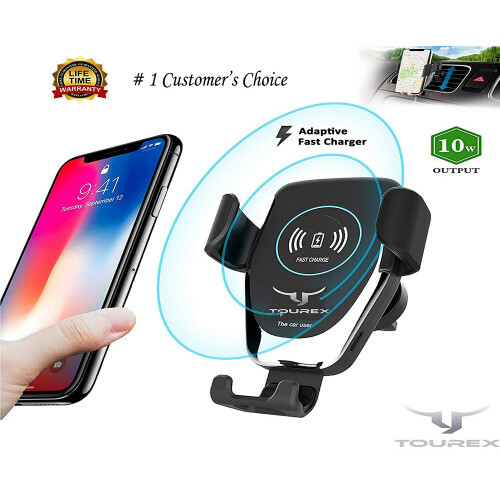 Comfortable and soft rubber design of the fast car charger wireless charger car mount prevents any scratches. Tourex Car Wireless charger Mount is Warranty and Packaging-The wireless car charger comes with 24 months warranty from the date of purchase. It comes in a great gift box that makes it presentable and suitable as a gift to wives, mothers, fathers and friends.To ensure you that you're making a risk free investment we offer a full refund warranty .If you aren't 100% satisfied you can get a 100% refund.so that you can buy our wireless car charger with full confidence. 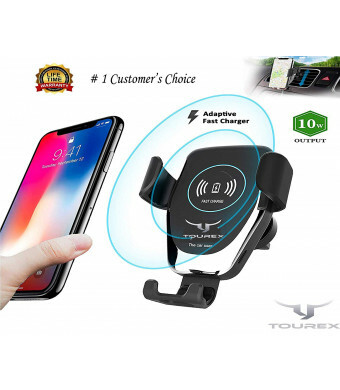 Triangle Fixation Design for this car wireless charger mount * With triangle fixation design and non-scratch silicone protective mat, your phone can be held firmly and securely, even in a complex road environment like speed bumps, rugged roads etc. Compatibility list: 1. IPhone 8/ 8 Plus / X 2. Samsung Galaxy S6 / S6 edge / S6 edge plus / S7 / S7 edge / S8 / S8 plus / Note 5 / Note 8 3. Nokia Lumia 920/ 1020 / 928 / 1520 4. HTC 8X / HTC Droid DNA / HTC Rzound / HTC Incredible 4g LTE 5. Moto Droid Maxx / Droid Mini / Moto Droid Turbo / Motorola Moto 360 Smart Watch 6. LG D1L / LG LTE2 / LG G2 (Verizon) 7. Google Nexus 4 / 5 / 6 / 7(2013) 8. Blackberry Z30 (Verizon) Specification: of this Car wireless charger Mount Power: 10W Input: DC 5V/2A or DC 9V-1.8A Output: 5V/2A (Max) Color: Black Conversion Efficiency85% Transmission Distance:2-10mm Frequency: 110-205KHz Package: 1* Fast Wireless Charger 1* Suction Mount 1* Air Vent Mount 1* Micro USB Cable 1* User Manual Q&A: Q: Why does it not charge my phone? A: Please try to wirelessly charge your phone without the phone case. if your phone is bigger, you can pull down the charger's tray and adjust the size to fit the bigger phones.The charging effect will be better if you dont use the phone case when charging. Q: Why does it charge slowly? A: We recommend you to use a Quick Charge 3.0 Adapter. Q: Why does it charge my phone intermittently? A:Please try to wirelessly charge your phone without the phone case. if your phone is bigger, you can pull down the charger's tray and adjust the size to fit the bigger phones. The charging effect will be better if you dont use the phone case when charging. Q: Can I charge my phone while using GPS? A: Yes. The best solution for heavy phone users in cars, such as Taxi, Uber, and Lyft driver.